AMS Device Manager’s enhanced bulk transfer functionality changes this paradigm, providing the tools to configure whole systems automatically – including setup of device alert monitoring and plant hierarchies. Users can simply export a tag list and open it in a spreadsheet application to enter a location and alert group for each device. Then, using bulk transfer, users can instantly set up the system with an accurately populated hierarchy and alert monitor. 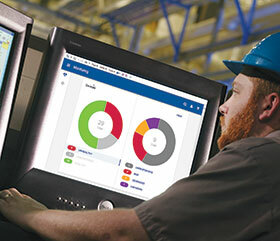 With a correctly defined plant hierarchy, maintenance teams can visualise device data in targeted views, allowing them to evaluate and manage the reliability of specific areas of the plant. This is particularly useful during shutdowns and turnarounds when selected plant areas are down for maintenance. Maintenance teams commonly have difficulty separating critical alerts from irrelevant ones. With the updated AMS Device View – the browser-based interface for AMS Device Manager – maintenance can assign devices to specific projects and track them on separate project dashboards, avoiding the distraction of alerts flooding the operations dashboard. This organised alert delivery allows more efficient response during periods with significant changes like shutdowns, turnarounds and outages. AMS Device Manager is a technology within the Plantweb digital ecosystem. It helps avoid unnecessary downtime through a window into the health of intelligent field devices, which gives maintenance and operations personnel the ability to work smarter. Based on real-time condition data from intelligent field devices, plant staff can respond faster and make informed decisions on whether to maintain or replace field devices. The Plantweb digital ecosystem leverages IIoT technologies, software, and services to expand digital intelligence throughout a workforce, augmenting workflows and processes to create new efficiencies and competencies that affect cultural and behavioural change within a company.